A February Spinter Tyrimai poll showed that if the presidential elections were held this coming Sunday, Lithuanians would send Gitanas Nausėda and Ingrida Šimonytė to the second round, while Saulius Skvernelis would be left out. That said, the ratings list no longer features Visvaldas Matijošaitis, who declared in February that he will not run for president. The question is – where did the support of the Kaunas mayor’s sympathisers go? According to the head of Spinter Tyrimai Ignas Zokas, the February survey no longer had the option of supporting V. Matijošaitis as a presidential candidate. The same company's survey from January performed on January 15-26 showed V. Matijošaitis had 6.2% support from voters, taking fourth place on the presidential rankings. "To this day, people are not fully decided on whether they will vote for a specific candidate. Or rather, such people exist, but they are a small part and most decide rather late. Another matter is that 6% is certainly not 30 or 40%. Just the error margin is 3%, so they can simply evaporate. Perhaps some went to Nausėda, some to the undecided, some to elsewhere. It is hard to say, the selection is too small," I. Zokas mused on who V. Matijošaitis' supporters could be backing now. On February 18, V. Matijošaitis declared that he will not run for president. The politician kept his decision secret until last minute, until the last day when people intending to run for president had to present the necessary documents to the Central Electoral Commission (VRK). According to political analyst Kęstutis Girnius, after V. Matijošaitis' withdrawal, his supporters could have flowed into the ranks of the undecided. Nevertheless, K. Girnius points out that it is curious that this did not occur. "Under normal conditions, you could think they would have supported Skvernelis, but Skvernelis' popularity has actually decreased. Perhaps they distributed themselves among those, who do not intend to vote or do not know who to vote for, but these percentages have also decreased. It is really hard to provide an answer," he mused. On February 18-28, another Spinter Tyrimai survey was performed on commission by Delfi and it shows that if the presidential elections were to be held this coming Sunday, 9.8% would not know, who to vote for, 7.4% would not vote, while 1.1% stated that they would choose other candidates, not included in the list. Thus, such voters comprise a total 18.3% of the respondents. In comparison, these groups totalled 18.4% of respondents in January. Vilnius University Institute of International Relations and Political Science (VU TSPMI) scientist Mažvydas Jastramskis says that it is simply impossible to tell, who the Kaunas mayor's electorate will support in the presidential elections. Furthermore, M. Jastramskis says that it is too small a percentage of people that there would be marked changes in the ratings chart. "From this aggregate level, we cannot say where those people voted. They may have not chosen anything at all, a part could have redistributed themselves among other candidates because Matijošaitis does not have a clear position on our political landscape, not to speak of the party system, thus lacking data at the individual level, I could not speculate, where these people went. Furthermore, these 6% are really not that many. It is only 60 respondents in the survey. Realistically, from my experience, it is never the case that one party's fall or some candidate's withdrawal would mean that all or most of the party or candidate's votes would immediately move to another candidate. Often it is the case that there is a sort of crumbling – some do not know, who to vote for if the candidate or party is non-present, some think that they will support someone else. If [V. Matijošaitis] had 15 or at least 10% ratings before, only then it could perhaps be seen. To me, seeing these ratings, it does not appear that his withdrawal would have any tangible influence," M. Jastramskis commented. While V. Matijošaitis avoids directly endorsing "Farmer" candidate Saulius Skvernelis to this day, the sympathies the two politicians' sympathies are clear. Nevertheless, based on political analyst K. Girnius, it appears that voters think otherwise. The analyst believes that since the number of undecided voters did not increase, while G. Nausėda and I. Šimonytė's ratings rose, one could assume that V. Matijošaitis' supporters split between these two candidates. "The migration could be more clearly uncovered if we knew the details of the survey, if the people were asked, if they supported Matijošaitis before, who do they support now?" K. Girnius said. He also adds that if the survey accurately reflects voters' moods, the dip in the prime minister's ratings could be viewed as a sign signalising that the Kaunas mayor's electorate will not rush to support S. Skvernelis in the elections. "If these survey results are not accidental and clearly show the voters' views, it could be a sign that these supporters of Matijošaitis were in no rush to support Skvernelis. Perhaps the opposite. Because If they had, Skvernelis would have caught up to Šimonytė somewhat, but he only fell further behind," K. Girnius mused. When asked why this could have happened, he suggested to recall that Kaunas voters used to be long-time Conservatives supporters: "It is hard to say. A theory is that we should recall that Kaunas used to be the Conservatives' city, thus the people, who now supported Matijošaitis have some sentiments to the Conservatives and shifted their support to Šimonytė. But this is just conjecture." Unlike Spinter Tyrimai, the public opinion and market research centre Vilmorus performed its February survey of Lithuanian residents prior to V. Matijošaitis decision to not run for president. This survey was performed on February 8-17. According to the head of Vilmorus, sociologist Vladas Gaidys, while S. Skvernelis' voters are clearly defined, V. Matijošaitis' average voter remains a mystery. "It was always easy to say, what Saulius Skvernelis' electorate was. It is clear there – older individuals and retirees, the unemployed, ethnic minorities, regional centres and the countryside. Visvaldas Matijošaitis' [voters] were never easy to describe, I have been unable to do so thus far, bar that he would receive votes in Kaunas. But in Kaunas you have a variety – the young and the old, the educated and not, everything. If we look across Lithuania, it is hard to define. The difference from Saulius Skvernelis is that Matijošaitis' [voters] are younger and better educated, but they are not the Nausėda or Šimonytė type," V. Gaidys said. According to the sociologist, based on demographic or social metrics, it is hard to guess, what other candidates those, who would have backed V. Matijošaitis, could choose. Nevertheless, the company asked voters in February, who they would choose in the second round of the presidential elections. From this, the sociologist notes, it could be seen that the Kaunas mayor's sympathisers found G. Nausėda most appealing. "In February, Matijošaitis was still in both he open and closed list. You can correlate this with there being a second round and, say, Nausėda and Skvernelis entering it. You can have a look at what those, who previously would have chosen Matijošaitis as a candidate for president, would do. There are far more of those, who support Nausėda, the ratio is toughly 36-22. 22 for Skvernelis. Others do not know, would not vote, but nevertheless, Nausėda wins against Skvernelis. If it were Šimonytė versus Skvernelis, the difference is minor, practically non-existent, but nevertheless, 24 for Šimonytė and 20 for Skvernelis in terms of Matijošaitis supporters. If it comes to Šimonytė versus Nausėda in the second round, Nausėda wins 2 to 1. You could say that these votes from Matijošaitis distribute themselves along the same priorities as in Lithuania: Nausėda, Šimonytė and Skvernelis," V. Gaidys said. According to the sociologist, while V. Matijošaitis does express favour to S. Skvernelis, this will likely not influence the election results. "I do not recall those transfers of votes ever deciding anything, people have their own opinions. Well, perhaps in exceptional cases. Perhaps it could be harmful if some massively unpopular politician endorsed someone or campaigned for them, it could become negative. That Matijošaitis is giving his votes to someone or that he gave votes, that cannot be proven empirically," V. Gaidys is convinced. Meanwhile, political analyst K. Girnius states that whether V. Matijošaitis's support for the prime minister will be of any value will only be revealed in the March ratings. "Factually, we have to wait for the next survey and much depend on how Matijošaitis endorses Skvernelis. 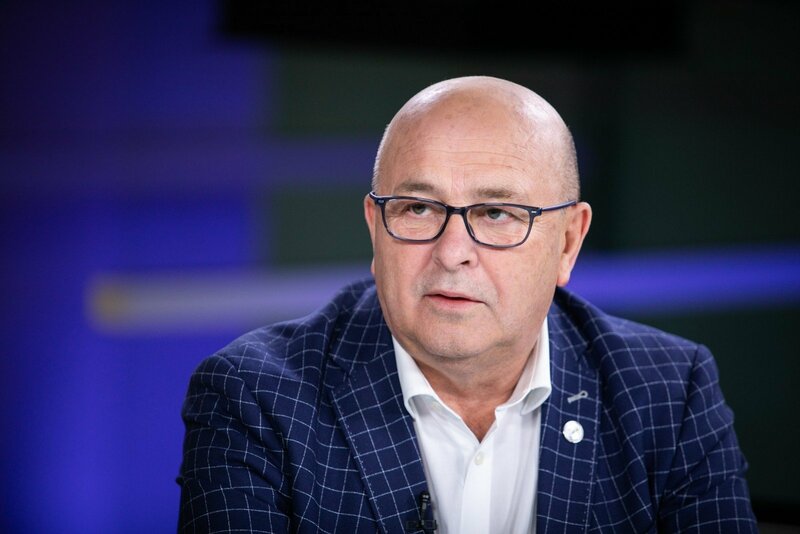 Will he say that he supports Skvernelis, that he thinks the latter is an excellent person, will he be prepared to more actively participate in Skvernelis' campaign, appear with him in events and otherwise seek to attract, convince his voters that they should vote for the prime minister," K. Girnius stated. The public opinion and market research centre Vilmorus performed a survey on February 8-17, surveying 1025 individuals. Based on this survey, G. Nausėda would receive support from 27.3% of voters, up from 23.3% in January. Conservative party candidate I. Šimonytė's ratings rose from 16 to 20%. Support for "Farmer" candidate S. Skvernelis did not change significantly. Based on the survey, the prime minister would have received 16% of the vote in February, compared to 16.9% in January. V. Matijošaitis had 5.8% support in the survey.